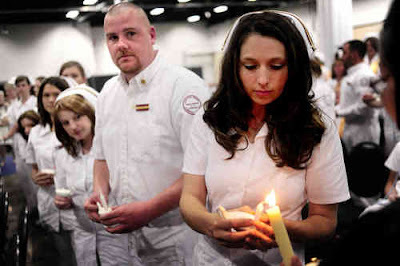 Germanna Community College graduated 72 new registered nurses last night. They are among more than 100 people who graduated from one of the school's medical training programs. The new graduates should have no trouble finding work. MediCorp Health System, parent company of both local hospitals, had 38 vacancies for registered nurses on its Web site this morning. In the back of her mind, Jan Broom always felt she wasn't quite good enough. After she graduated from high school in 1973, all of her friends headed off to college but she didn't have the money to go. When her only child started college 20 years later, she pushed Broom to resume her own studies. "She was firm with me. 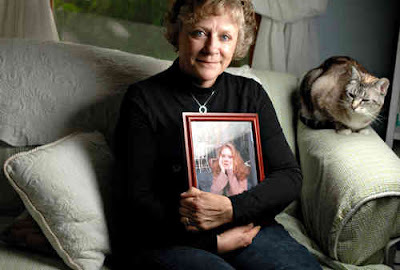 'Mom, you've got to get a life of your own,'" Shannon Broom told her mother. That launched Jan Broom on a journey that brings her to her own graduation. Tonight, Broom, 54, receives her associate degree in general studies from Germanna Community College. She has been accepted into the bachelor's degree program at the University of Mary Washington, her daughter's alma mater. "When the letter came, I realized I don't necessarily need to go. I just wanted to be able to say I got into the same college she did," Broom said this week during an interview at her Spotsylvania County home. Broom plans to take a course on memoir writing at UMW this summer but is unsure if she'll continue her studies beyond that. The goal is to tell Shannon's story. Tonight, Broom will have the graduation she thought would never come. Not only will she receive a college degree, her 78-year-old mother will be there. The day Broom graduated from high school her mother had a medical emergency and missed the ceremony. Throughout her studies at Germanna, Broom has had varying thoughts about being an older student. She noticed those around her were in the throes of dramas that play out in the lives of 20-year-olds. She found herself surrounded by incessant texting. And she encountered one instructor who didn't think middle-aged women should be enrolled in high-tech courses. She confronted the instructor, who changed his attitude and his mind. And she took classmates under her wing. Biology instructor Shashuna Gray was so impressed with Broom that she nominated her for an award of excellence for biology. Gray described Broom as "a dedicated, hardworking student with a zeal for learning." She also noted Broom "considers herself the mother of the class and reaches out to help her classmates study and prepare for course assignments." Broom was honored to be one of 33 Germanna students singled out for an award but said she wasn't initially ecstatic about how she was described. "At first, I was offended a bit," Broom said. "And in the next second, I thought there couldn't be anything better. "That's what I wanted to be--a mother." "Janice Broom is a dedicated, hardworking student with a zeal for learning, especially biology. Jan considers herself the mother of the class and reaches out to help her classmates study and prepare for course assignments. It has been an honor to have her in both Biology 101 and 102." --Instructor Shashuna Gray, on why Broom was chosen for an award of excellence in biology. Germanna Community College's graduation speaker offered words of advice last night, telling the class of 2009 to find their passion, retain their integrity and respond to opportunities. Lisa Seay, a Germanna graduate herself, also offered insight-- into the struggles many of the students had endured to reach the finish line. 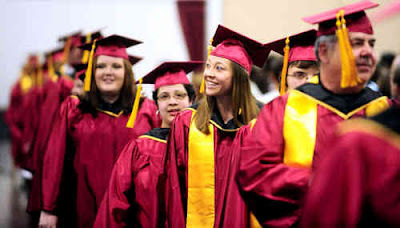 But the most significant thing Seay may have to offer--at least to some of the graduates--is what many people graduating from college today find is in short supply: a job. Seay is vice president of development for Spotsylvania Regional Medical Center, an HCA hospital slated to open near Cosner's Corner next year. Among the Germanna students graduating yesterday were dozens with health care training. More than 70 men and women completed the registered nurse program this spring and received associate degrees. Another 13 received certificates for completing practical nurse training. In addition, 18 earned a certificate for phlebotomy work, five earned a certificate as scrub nurses and one finished nurse-aide training, according to graduation materials provided by the college. Thirteen earned degrees for dental hygiene. If the nursing students follow Seay's path, they will go on to earn bachelor's and master's degrees. "This is one accomplishment in your life," Seay told the graduates assembled at the Fredericksburg Expo and Conference Center last night. "It was not your first, nor will it be your last." Seay was in her mid-20s with two young children when she began taking classes at Germanna to become a registered nurse. She remembered studying while her then 2- and 5-year-old boys were sleeping, and even taking them to class on occasion. That effort launched a career that has included nearly two decades in both clinical and administrative positions in Virginia. Seay urged the graduates to "create a vision" to guide them through life as they pursue their passion, maintain their integrity and seize opportunity. Nursing graduate Laura Daniels challenged her classmates to inspire others to pursue their dreams and to view their diplomas as "a map that continues to unfold, a GPS that continues to reset." Though Seay's and Daniels' messages were well-received, it was Germanna President David Sam who received the most resounding applause--apart from the graduates. The first came when he volunteered to stay as long as necessary to be sure every family got a photo of their graduate receiving a diploma. The second came when he uttered words many in the crowd never thought they would hear. 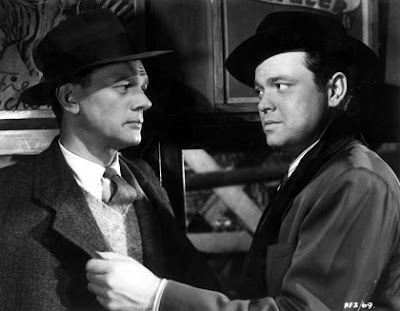 Germanna Community College's Center for Workforce and Community Education kicks off the Rappahannock Film Club Cinema Series this Saturday with a showing of "The Third Man." The film series is aimed at providing an affordable cultural experience during tough economic times, according to Germanna spokesman Mike Zitz. No reservations or advance ticket purchases are necessary. The program is officially considered a non-credit class and will include a post-screening panel discussion featuring Germanna faculty and Rappahannock Film Club members. "The Third Man," made in 1949, is a mystery set in post-war Vienna, Austria. The cast from the Oscar-winning film includes Orson Welles. Jeanne Wesley, vice president of Germanna's Workforce and Community Education program, said she hopes to see the series continue indefinitely. "It's a great, inexpensive way for people to come out and talk to one another and see some really good films, too," she said.